Alfred Druschel was born on 4 February 1917 at Bindsachen in the Büdingen region of Oberhessen. He joined the Luftwaffe on 1 April 1936 with the rank of Fahnenjunker. He attended the Luftkriegschule at Berlin Gatow and Rangsdorf from 1 March 1938. Leutnant Druschel then trained as an observer at the Kampffliegerschule at Tutow and Fassberg. Later he served as Ordonnanzoffizier on the staff of a Luftflotte. On 1 July 1938, Druschel was posted to Fliegergruppe 20, which was redesignated II. (S)/LG 2 on 1 November 1938. He was assigned to the 4. Staffel. He served with 4. (S)/LG 2 during the invasions of Poland and France flying Hs 123 biplane ground attack aircraft. The unit was at the forefront of many of the important battles that took place during these campaigns, including Bzura in Poland, Eben Emael in Belgium, Dunkirk and the Wegland line near Auxerre in France. Druschel was awarded the Eisernes Kreuz 2.Klasse on 27 September 1939 and the Eisernes Kreuz 1. Klasse on 21 May 1940. Druschel was appointed Staffelkapitän of 4. (S)/LG 2 in August or September 1940. He led the unit on many fighter-bomber missions against targets in England and shipping in the Channel. From 5 April 1941, 4. (S)/LG 2 was based in Bulgaria operating over southern Yugoslavia and Greece. Druschel then led the unit during the invasion of Russia. He operated over the Eastern front until October 1943, firstly as Staffelkapitän of 4. (S)/LG 2 and then, from autumn 1941, as Staffelkapitän of 2./Sch.G 1. At the beginning of 1942, he was appointed Gruppenkommandeur of I./Sch.G 1 and in October 1943, he was appointed Kommodore of Sch.G 1. He was active over all areas of the Eastern front, operating with outstanding success supporting the army in attack and defence. Oberleutnant Druschel was awarded the Ritterkreuz on 21 August 1941 for seven aerial victories and over 200 missions. Hauptmann Druschel was awarded the Eichenlaub (Nr 118) on 3 September for 600 combat missions and the Schwertern (Nr 24) on 19 February 1943 for over 700 combat missions. On 11 October 1943, Druschel was appointed Inspizient der Tag-Schlachtfliegerverbände with the General der Schlactflieger. He was promoted to the rank of Oberstleutnant on 1 April 1944. Druschel was appointed Kommodore of SG 4 based on the Invasion front on 25 December 1944. On 1 January, he was promoted to the rank of Oberst. On 1 January 1945, Druschel participated in Operation Bodenplatte, the attack on the Allied airfields in Holland and Belgium. Accompanied by JG 2, SG 4, led by Druschel, were targetting St Trond in Belgium. He became separated from his formation following a heavy flak attack and remains missing to this day in the area south of Aachen. 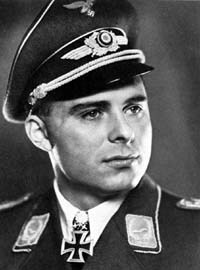 Alfred Druschel was credited with seven aerial victories in over 800 missions, mainly ground support missions flying Hs 123, Bf 109 and Fw 190 fighter-bombers.